City Councilman Jonathan Curtis, Mayor Pro Tem Terry Walker, Daniel Fernández Multigner, Jack Applebaum, Mayor Michael Davitt, Catherine Condit, Eva Perez Prieto and City Councilman Len Pieroni display proclamations and artwork associated with La Cañada Flintridge’s first Sister City agreement with Villanueva de la Cañada, Spain. 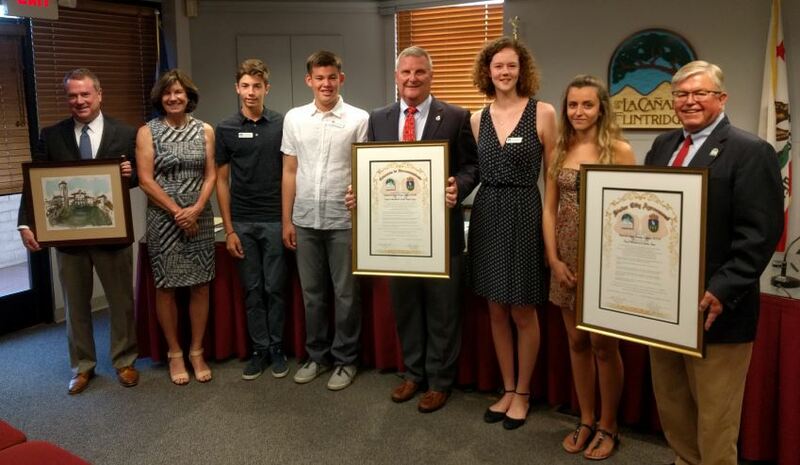 City Council members greeted exchange students brought to La Cañada Flintridge from its first sister city, Villanueva de la Cañada, Spain, at the council meeting Wednesday, July 5. “Hopefully, you’re going to enjoy your time here. 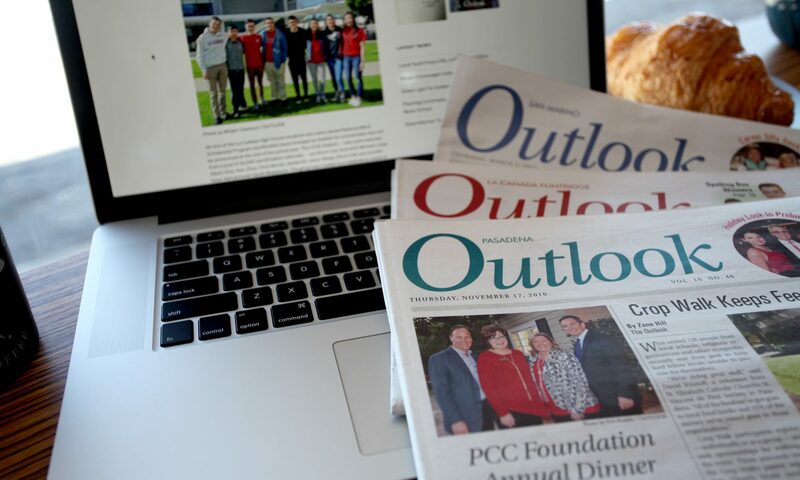 I know there are all sorts of activities planned,” LCF Mayor Michael Davitt told the first participants of a new La Cañada Flintridge Sister Cities Association. 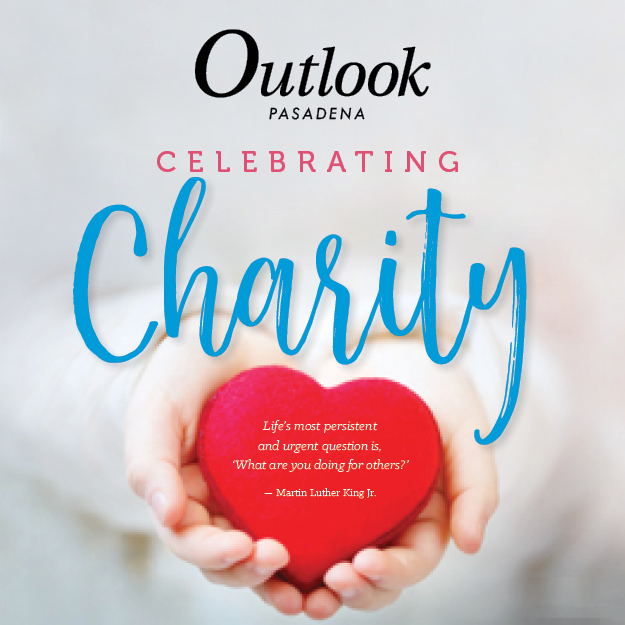 The program is designed to offer opportunities to travel, build partnerships, and promote peace and understanding. Eva Perez Prieto and Daniel Fernández Multigner, teens from the Spanish town with whom LCF recently was matched via the Sister Cities International program, offered quick hellos and posed for photos that will commemorate the program’s successful launch. Germany’s Cornelia Anna Maria Backhaus also greeted city officials. She hails from Düsseldorf, a city that also might become a sister to LCF if discussions work out. Since it was founded in April 2016, the LCF Sisters Cities Association has signed a long-term Sister City agreement with Villanueva de la Cañada, sent 11 students to two international youth leadership summits, and hosted visitors from France, Spain and Germany. The LCF Sisters Cities Youth Group has grown to include more than 30 members from all four high schools, including Catherine Condit and Jack Applebaum, who were selected to travel to Spain to represent the city later this summer — in exchange for hosting Perez Prieto and Fernández Multigner. This year’s Youth Group Executive Board members include Naomi Stephen as president, Stefan Markarian as vice president, Stephanie Kiang as membership coordinator, Cinthya Hernandez as secretary, Kelly Steele as event coordinator and Condit as financial secretary. After a request from Councilman Jonathan Curtis, the council decided to postpone approval of an agreement with a pair of firms that are expected to provide architectural or planning services until the City Council learns more about what they will do. The Planning Department is hoping to bring on Lilley Planning Group and Willdan Engineering to help expedite planning and architectural services within the city at a cost of as much as $135,000 combined. Council members plan to discuss the proposed services at their next meeting on July 18.